This book is a damning indictment of the cowardice of men in leadership, a testament to the courage and sacrifice of those they presume to lead. 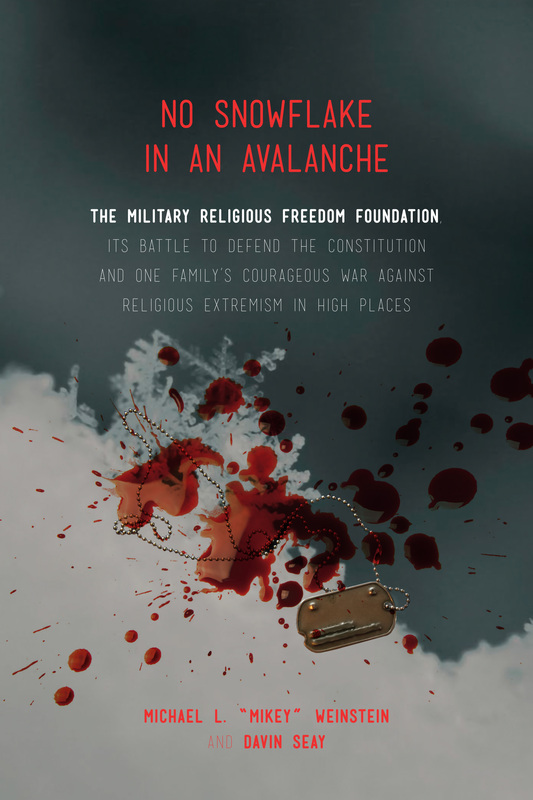 For anyone who’d thought a nascent and growing extreme fundamentalism in the USA merely a threat, this book should make them think again and should rightfully frighten and galvanize to action anyone concerned a cult within our military can both: break the mentality of, and train a young officer for future assignment to launch nuclear weapons. Where to begin? I could write essays on multiple subjects of peril this book has only scratched the surface of, yet that scratch bleeds profusely throughout its pages. It may seem odd to some that, for me, the most striking and empathetic passages of the book is a wife and mother with Multiple Sclerosis surrendering her dream of a life as uncomplicated as possible, as a matter of principle, giving up her pursuit of happiness and the American Dream to take on the malignant social cancer infesting and infecting what must ultimately be what our nation is judged by in the eyes of today’s world; The perception of American empire, the Armed Forces of the United States of America. As I write, I know empathy, suffering Neuro-Behcets Syndrome, a mimic Multiple Sclerosis. My own desire has been many years wishing only to live out those years I have left in peace, but no, a narcissism of arrogance circumstantially known as fundamentalist Christian dominionism has dictated my duties according to conscience as well. Yes’m, I understand and know empathy in our common alliance against evil. The human dimension is profound, the humiliation, the grief, the sacrifice and the fighting back against stacked odds at every turn for those ethical civilian and military warriors detailed in this book. Where to begin? Striking is the thought, here is the true story’s protagonist with impeccable conservative credentials, Michael L. ‘Mikey’ Weinstein, breaking down every stereotype and smashing every barrier in a focused, concerted effort which, if successful, and there is no guarantee of success, should win the admiration of dyed in the wool liberals, feminists particularly, and people of every sane persuasion. Mikey has marched a long march to arrive on the cusp of achieving immortality in history. I am moved by his story and, by my own independent research, towards expending precious drops of my own small reservoir of life force to help Mikey achieve his goals. This is no small achievement in its own right that a man, Mikey Weinstein, would have come so far in his personal evolution as to overcome his history of working to keep Iran-Contra from spilling into the open under Reagan, to win my avowed admiration. But here again is a striking moment, it was my own experiences as a soldier had turned me against wars altogether, no different to Howard Zinn. Mikey fits the same mold, only we each have our separate timelines to fated evolution and goals. Mikey’s goal is quite straight forward. To take the American military, the most lethal military in the world by far, out of the hands of and keep it out of the hands of, what can only be accurately described as Madmen. Any such endeavor is highly worthy of my liberal support. Where to begin? Critically important, the book makes a case for young American service women and men dying in vain on account of the narcissism, and nothing more, of those General Officers and politicians trusted with our soldiers care at the highest levels of these United States of America’s institutions, whether at the level of the Joint Chiefs of Staff or sitting in either house of Congress. This last will be the focus of my essay; I will leave the several other critically important subjects to the insights of other reviewers. I cannot speak to nukes as an expert, there are better qualified to speak to contemporary military/civilian life, but one thing I had dusted off and polished these past several years were my intelligence analysis skills. Here follows my analysis, in lockstep with the books conclusions, insofar as how deeply penetrated and compromised our military’s highest offices and ranking officer corps have become by dominionism and will yet cost us dearly in American lives and blood. In my day, our Special Operations Forces had not yet become pervasively criminalized. We saw ourselves more along the lines of an elite Peace Corps working the most hazardous territories of a Cold War world. Critical to our mission was pacification of populace in the areas we worked, and pacification is and was a straightforward word. We worked to bring peace to neighborhoods in conflicts. John Wayne stereotype aside, the military aspects were honest endeavor to provide self-defense training to remote villages with an objective the populace could not be easily exploited by irregular militia, but that was never going to be accomplished in any case, except that we understood and respected and even integrated to the local customs and culture. That we had elite and lethal training was primarily survival oriented, yes there were the occasional ‘special operation’ to perhaps decapitate the leadership of a particular guerrilla group or undertake sabotage behind enemy lines in the course of our work, examples given, but this was the exception, not the rule. Primarily our superior skills were required to operate small teams in areas where we might meet with considerably stronger numerical force. The highly honed and elite skills of the 1960s and 1970s Green Berets teams were more often than not, more than equal to any larger irregular force. If vastly out numbered, we knew how to inflict savage and costly casualties on our pursuers in the course of evasion. In our pacification work, Action Anthropology was the norm of the day. We integrated to our human and social environment. We were armed educators, medical providers and social workers. We were not primarily meant to be offensive; to the contrary, restraint was a big piece of our discipline and training. Cowboy mentalities were not tolerated. It is quite clear things have changed away from this focus, dramatically, for the military applications of special operations forces, in the approximately four decades since Vietnam. In the span of a few hours or so in Iraq, one Special Forces team leader, inflamed by watching the ‘Passion of the Christ’, instigated an incident that effectively made a war zone of an entire neighborhood and radicalized several hundred, perhaps several thousand Muslims. This commissioned officer had used a bullhorn to have “Jesus kill Mohammed” blared into a Muslim neighborhood, and when the perfectly predictable reaction was everyone with a gun in that area of the city showing up to shoot at this moron, a weapon that could blow through the front and back wall of a house was turned on the neighborhood homes by the Special Forces team. Many of those consequently radicalized Iraqis no doubt turned to local militia and offered their services to train to kill our regular American soldiers over this one of many [unpunished] incidents of Christian extremism provided elite training. Our ‘elite’ forces had just accomplished the absolutely criminal act of getting more Americans killed in future battles. This is the criminalization of our special operations forces by extremist Christian fundamentalist commanders. Who are those commanders? I will name two. General Patraeus. It is common political knowledge in Washington DC that President Obama had appointed General Patraeus to head the CIA as a means of sidelining the General’s political ambitions over serious concerns Patraeus would hook up with the likes of Sarah Palin or Michelle Bachman in a run against Obama for the presidency in 2012. Either way you have it, a commander-in-chief, whether a military veteran or not, is a sword that can cut two ways. Obama’s naiveté in military affairs, having never served, is the 2nd worst possible circumstance in an America where naked fundamentalist ambition has overtaken the leadership of American military command structures, outside an out and out fundamentalist president. That Obama would, as a matter of political expediency, appoint Patraeus to head up the CIA with its out of control Operational Division working in close concert with the radicalized and criminalized Christian extremist special operations forces of today’s American military, is simply asking for disaster. General Patraeus was key [together with Robert Gates] in convincing Obama to radically beef up the USA’s special operations forces, at a time it was already decided the overall troop numbers would have to be reduced. General Patraeus has had a close association with special operations forces throughout his career. Since Patraeus appointment to DCI [Director of Central Intelligence or CIA] Admiral William H McRaven, now overall boss of the special operations forces which these days are routinely assigned to CIA operational missions, has requested his forces be allowed to operate outside the traditional Department of Defense channels. This is, no doubt, a sleight-of-hand grab for these elite forces away from normal supervision via established Department of Defense structures, and away from oversight by Admiral McRaven’s professional associate CIA Director Patraeus. This cannot be a good thing. The myth of General Patraeus in the public purview is a demonstrable tactical lie. In fact the ‘surge that turned around the war in Iraq’ for which he became famous was at best a deceit along the lines of a shell game or bait and switch. General Patraeus beefed up the American force, momentarily disrupted the insurgency with an all out push that could not be sustained in any case, and then pulled the bulk of the American forces back to their bases and took the Americans, for the first time, largely out of public circulation before the insurgents could regroup. It is this removing the American soldiers from the everyday Iraqi life which had dramatically dropped the violence in Iraq, nothing more. The same could have been accomplished in 2004, and honestly at that, were it not for literally crusading extremist neo-con commanders and secular officers afraid to speak out and challenge the status quo at the CIA and Pentagon, to call a spade a spade, a career ending move. It is truly Faustian, if you speak out your career is over and you have been weeded from the ranks which only become more Christian extremist with the favored or ‘blessed’ replacements, if you keep your mouth shut, it all evolves towards fascism regardless. Moving over to Afghanistan, notoriously there have been many special operations forces crimes, inclusive of attacking a wedding where fleeing women and kids had been shot in their backs, cold blooded murders. We pay the Afghans compensation but the root problem of anti-Islam fundamentalism is never effectively addressed and the hate for the Americans only spreads. General Patraeus has had a large hand in keeping these American special operations independent of NATO, effectively exercising impunity and generating a strengthened Taliban when the Americans are seen as a worse curse. Now, we are seeing the full fruition of the crusading mentality and criminal anti-social behaviors with the ‘burning of the Koran’ riots in Kabul triggering a long pent up but growing frustration of the Afghan people as a whole. No Snowflake in an Avalanche points towards the inevitable conclusion: Our fundamentalist neo-con Generals, in the guise of patriotism, have handed an untrained Obama a perfect storm. This is no accident. The book’s holdings are consistent with the preceding scenario I have drawn for the reader from my knowledge of social psychology, special operations intelligence and tactics. The book meticulously documents the facts of the extremism in our military leadership; it is a well written book, concise and cohesive to the points of sedition and treason at the highest levels of the United States Armed Forces and matches my independent assessment of these past several years, summarized in the preceding. Review by Ronald Thomas West, Vietnam Veteran, recipient of the United States Army Commendation Medal (individual citation) & the Vietnam Cross of Gallantry (Brigade Aviation, 199th Light Infantry Brigade, unit citation.) Subsequent to extended tour of Vietnam, Ronald served as non-commissioned officer in charge, operations & intelligence, Detachment 1, Company C, 5th Battalion, 19th Special Forces Group. Ronald also achieved Distinguished Graduate status at the Hawk Improved Missile program at the U.S. Army Missile School, Ft Bliss, Texas. Ronald’s family tree has soldiers serving in nearly every period of American conflict including the Civil and American Revolutionary Wars. Immediate family members who have served in the military include both grandfathers, his father, uncle, brother, nephew and two of his three sons.